Last night I attended a cook out with some friends. The topic of Romans (or was it Greece) came up and of course the 1st thing popped out of my mind was "Vice". If you are familiar with Roman history, you would know their culture was full of "Vice". From the well known gladiators in the Colosseum to murder of family and friends for the sake of power to sexual escapades that still make us blush...the list goes on, but you get the gist. Now, I will say, that I was a horrible history student (math too, but that irrelevant to this post) through out my public school education years. I was a consistent D student until college. I went to college for Fashion Design and when I heard that I had to take history classes (art and fashion history), I groaned. Due to my past performance in the subject of history, I dreaded having to learn more with the added factor of paying for these classes. To my surprise and with the aide of a superb professor (who looked like a Greco-Roman god), I did exceedingly well. Even odder than that, I actually want to teach history to younger student 18- in a similar manner to my professor...mixing history with interactive art. That is a work in progress. More like, I have a bunch of ideas, but no follow through yet. Back to the subject of Rome in a way. Since college, the only history lessons I've had are via the History International channel. Go learning by TV!!! I took a particular interest in Greco-Roman history because of all the amazing inventions they had that I never really knew about. Perhaps I was taught them in public school, but then again that "D" says I wasn't paying attention all that well. Being a fashion major, the costume of the period was obviously interesting too. The Vice is what really got me hooked and a bit horrified. Caligula is of particular interest. He is most likely the worst of them all. I won't go into his history, the Wikipedia link I attached to his name will give you a good over view of his reign and history. On, Friday August 14, there will be a Roman Hedonism night at the local club I go to. Though, I will not be participating in the Hedonism, I will be wearing a costume. I think I will be making long cream summer dress and adding Roman details to it. Essentially, if I'm going to be spending a fair bit of time working on a real costume, I want it to be worn more than once and not always look like a costume. 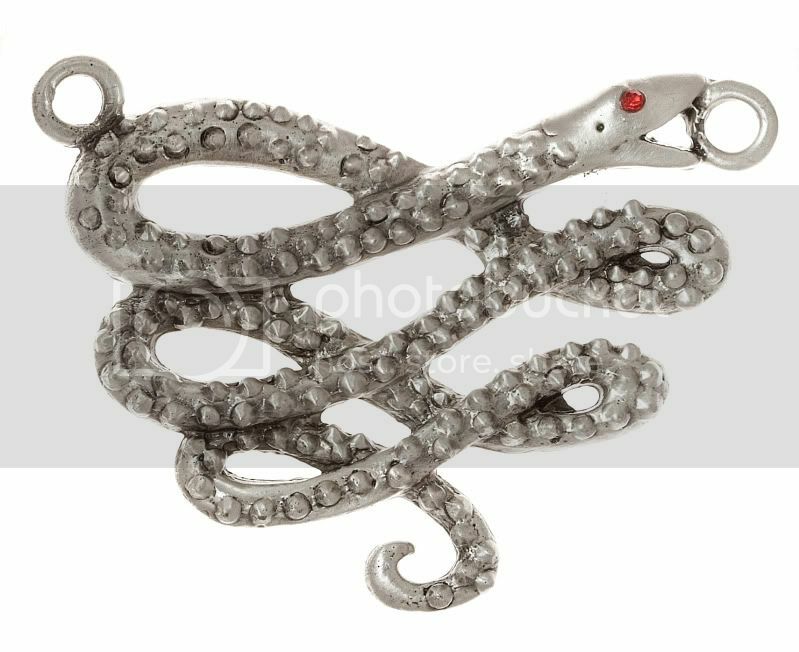 I already have Roman sandals and I purchased a bended snake pendant. 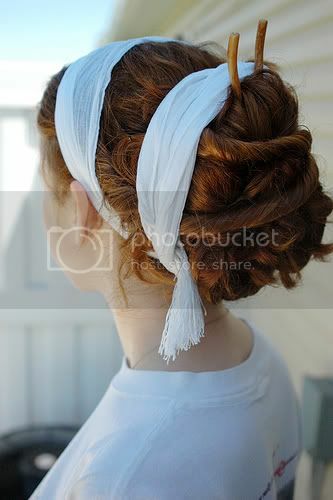 I have hair bands that will turn my hair into a Roman style. I hope all goes well. My hair is not long enough to put in a bun, but I could braid it back as far as I can. Though, it does appear this lady has fake hair braided into her own...note the difference in color between the hair on the scalp and the hair in the bun. 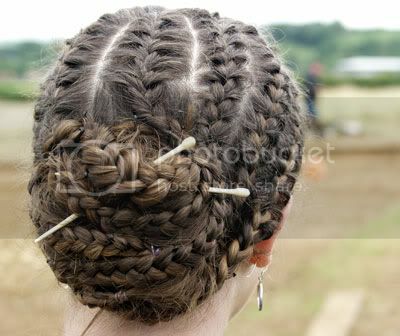 This is a good example of the hair wraps adorning many Roman hair styles. Though the original ones are more likely to be made of finer fabrics and ribbons. I almost forgot the most simple hairstyle, a pony tail...I mean a Chignon. The term Chignon can also reference what we call a "bun"
I am trying to find some artwork or a photo of someone recreating a Roman woman's make-up, but for now this article Handmade Cosmetics in Ancient Times by Debbie Bilezikian will cover this topic very well. The sandals I'll be wearing are similar to these made by bellacaribe, but mine are not leather and are white. The over all style is the same though. I purchased this from Michael's (a chain craft store). It's from Blue Moon Beads' "Manor House" collection. I also purchased this chain necklace from the same collection. It should go nicely with the snake pendant. This will be a simple necklace construction, but if you are looking for new projects, I suggest the Idea Gallery - Beads. It showcases jewelry projects of varying skill levels. 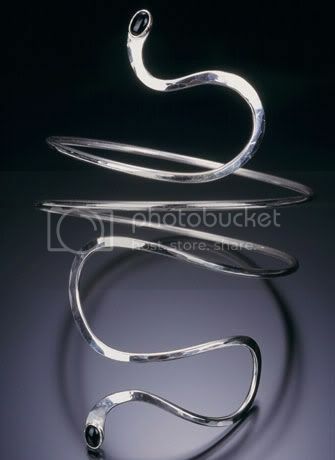 I have yet to chose earrings, but I will most likely be wearing a simple metal arm band similar to this one. This one references Egyptian culture, but if you remember Cleopatra VII had relationships with Julius Caesar and Mark Antony, for which she bore children with each. Cleopatra's style influenced Roman culture as it did Egyptian culture. Ionic Chiton - This is a column of fabric with pins (think fancy safety pin) at shoulders and a rope belt at waist. Also, note the hair, I mentioned before that I have hair bands that I will be wearing to depict a favorite Roman hair style. This picture shows what that hair style would look like. I plan on curling my hair and then placing the bands in it. Doric Chiton - Take two large rectangles of fabric (one for front and one for back), pin tops together from shoulder to wrist and tie a rope belt at waist to cinch dress to the body (I couldn't find a good drawing of what it looks like with the belt). Ionic Peplos - Column of fabric that is folded over at the top, pinned at the shoulder and belted over the doubled over fabric. Notice the hems of the doubled fabric and bottom of the dress have decoration. You could use a ribbon trim or embroider a design onto those hems. 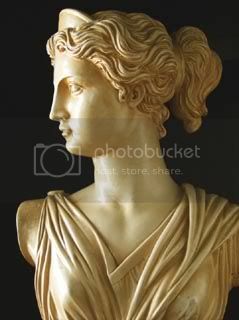 Doric Peplos - Take a column of fabric, double it over at the top, pin at shoulders and belt waist under the folded area. In this picture she is holding a Stola which would be used in colder weather to cover your self more. - there are hundreds of pages of all sorts of Art...sculpture, glass, mosaic, reliefs, architecture, pottery, jewelry, etc. There are also some Renaissance paintings of Roman gods and goddesses which is a good reference to both periods of art.